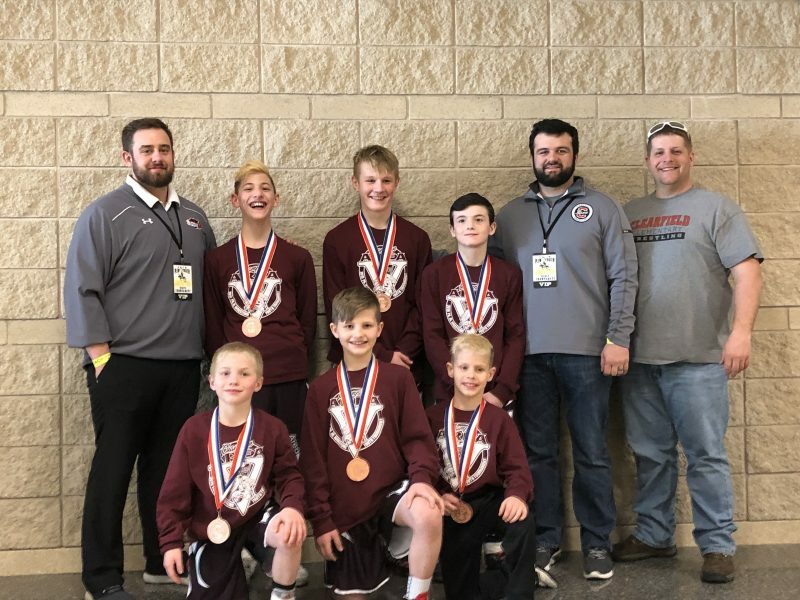 Front left to right Bo Aveni 4th, Colton Bumbarger 8th, Matthew Rowles 6th, back Row Coach Funk, Will Domico 7th, Carter Chamberlain 3rd, Brady Collins 2nd, Coach Danver, and Coach Rowles. 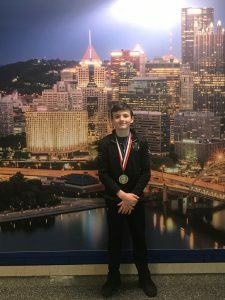 PITTSBURGH – Clearfield Bison Youth Wrestlers competed in the Pennsylvania Junior Wrestling State Championships on March 16 and 17 at the Peterson Events Center in Pittsburgh, PA. The young Bison had 13 wrestlers compete in the championships came away with six medals. Leading the young Bison was Brady Collins in the 11 &12 age bracket at 90 pounds. Collins finished second, going 3-1 on the weekend and losing 6-1 to Area 14 champion Kollin Rath in the final. This was Collins’ third finals appearance after winning the championship in 2018 and placing second in 2016. Carter Chamberlain put forth a very strong performance to finish third in the 11 & 12 145-pound bracket. Chamberlain went 6-1 on the weekend with his only defeat being to eventual champion Caleb Marzolino from Area 12 in the quarter finals before winning four straight matches. This was Chamberlain’s first PJW Medal. Bo Aveni claimed his first PJW medal in the 8 & under 60-pound division. Aveni finished fourth, going 4 and 2 on the weekend, with both losses coming to Area 13 third placer Kane Kline. Following a quarterfinal loss, Aveni won three straight matches to reach the consolation final. Matthew Rowles earned his second PJW medal, a sixth place finish in the 9 & 10 55-pound weight class. Rowles reached the semi-finals with three straight victories on Saturday before taking three tough defeats on Sunday to finish sixth. Will Domico won his first PJW medal in the 11 & 12 105-pound bracket. Domico went 5-2 on the weekend en route to his seventh place finish. Clearfield’s final Placewinner was Colton Bumbarger in the 9 &10 85-pound division. Bumbarger finished in eighth place after going 4-3 for the weekend. Other Clearfield wrestlers competing but finishing outside the medal rounds were Sonny Diehl, Carter Freeland, Colton Ryan, Brayden Wills, Ty Aveni, Cash Diehl, and Hunter Ressler. Diehl wrestled in the 85-pound female 9 & 10 division. The first girl from Clearfield to compete at the state tourney, she reached the semifinals with two victories, but then lost two straight to finish in the top six with only four place winners being awarded in the female division. Freeland went 2-2 at 105 pounds in the 11 & 12 bracket while Aveni went 1-2 at 100 pounds in the same age group. Also competing in the 11 & 12 division were Diehl and Ressler at 75 and 135 pounds. Both went 0-2. Ryan & Wills were both 1-2 at 70 and 120 pounds in the 9 & 10 division, respectively.